Tonysha Nelson and Patavian Lewis are better recognized as Kandy Apple Redd. They're multi-dimensional international performers who are gaining fans across the globe, in fact, in the past eighteen months, KAR has performed more than two hundred concerts in over seventeen countries as part of P-Funk under the direction of their legendary Grandfather, George Clinton. Kandy Apple Redd's international flair comes naturally. Tonysha was born and raised for a time north of the border in Scarborough, a suburb of Toronto and spent her formative and teen years in the DC/Maryland area. Patavian was born in Los Angeles and spent her youth on the family farm in Brooklyn, MI. Spending summers together on the farm, with Tonysha and eventually moving to Maryland, they solidified their bond as sisters living a fairly typical childhood. In fact, it wasn't until later in life did they truly understand the cultural significance of their legendary clan while traveling the world and seeing the fans clamoring for more. As part of the Clinton Dynasty, one knows these ladies have been singing since childhood and are not the pre-fab studio confection of many of today's pop stars. But let's not get ahead of ourselves. For Kandy Apple Redd, being granddaughters of Dr. Funkenstein means standing in prodigious shoes which cannot be easily filled. So, rather than attempt to mimic their elders, KAR are creating their own lane. Their forthcoming debut EP "KAR's Comin' " is a gumbo of sound, containing influences of R&B, Hip Hop, Neo-Soul, Jazz, Black Rock and of course PFUNK. 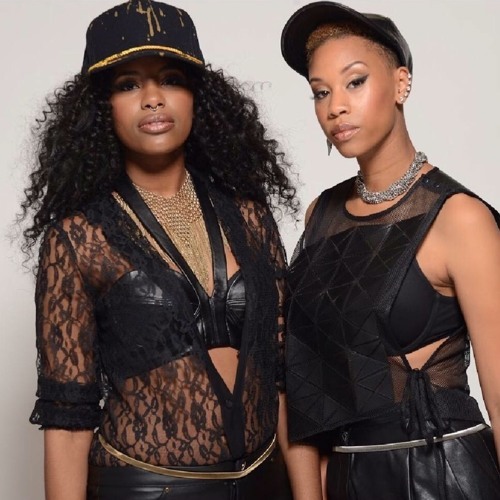 While proudly flaunting the Clinton name on Instagram and Facebook as #DemClintonGirls, Kandy Apple Redd still strive to cultivate a unique and diverse sound true to their musical DNA. “Kandy Apple Redd stands for Individuality. We want people from different races and backgrounds to be inspired by us. We want to be a positive influence on our generation and make music that restores confidence, love, and good vibes.” Kandy Apple Redd’s lead single “This Club” is a true Clinton family affair. The high energy club banger features the production imprint of their talented cousin (and brother) Tra'zae Lewis Clinton, himself annointed by the man they all lovingly call "G". On "This Club" the ladies come hard, rocking the mic singing, chanting, and seducing the listener into submission. "This Club" is a sort of musical "Declaration of independence" proudly proclaiming "this ain't what you used to!". From the first downbeat to it's off kilter melody, "This Club" is ready for dance floors the world over. Like many young women of today, Tonysha and Patavian are both working moms; but instead of taking up office jobs, Tonysha and Patavian are road warriors taking their show on the road. The challenges of balancing a career in entertainment and motherhood can be daunting. Between juggling school lunches and PTA meetings, along with vocal rehearsals, studio sessions, and the stage, Kandy Apple Redd passionately tackle both realms. It's something they do with grace and aplomb, heck - It's what black women have done for generations. Especially when the mission is more. So...from Toronto to the DMV and from New York to London, get ready for more cause "KAR's Comin"